The greatest physicist of the medieval era led a life as remarkable as his discoveries were prodigious, spending a decade in prison and at one point possibly feigning mental illness to get out of a tight spot. Abu Ali al-Hassan ibn al-Haytham (Latinized to Alhazen) was born in Basra, now in southern Iraq, in ad 965. His greatest and most famous work, the seven-volume Book of Optics (Kitab al-Manathir) hugely influenced thinking across disciplines from the theory of visual perception to the nature of perspective in medieval art, in both the East and the West, for more than 600 years. Many later European scholars and fellow polymaths, from Robert Grosseteste and Leonardo da Vinci to Galileo Galilei, René Descartes, Johannes Kepler and Isaac Newton, were in his debt. Indeed, the influence of Ibn al-Haytham’s Optics ranks alongside that of Newton’s work of the same title, published 700 years later. Interest in optics began in antiquity. The Babylonians, Egyptians and Assyrians all used polished quartz lenses. The basic principles of geometric optics were laid down by Plato and Euclid. They included ideas such as the propagation of light in straight lines, and simple laws of reflection from plain mirrors. The earliest serious contribution from the Islamic world came from ninth-century Arab scholar Ya’qub ibn Ishaq al-Kindi. Sometime during the first decade of the new millennium, he proposed an ambitious project to dam the Nile. He was invited to Egypt by the Fatimid caliph al-Hakim bi’amr Illah. 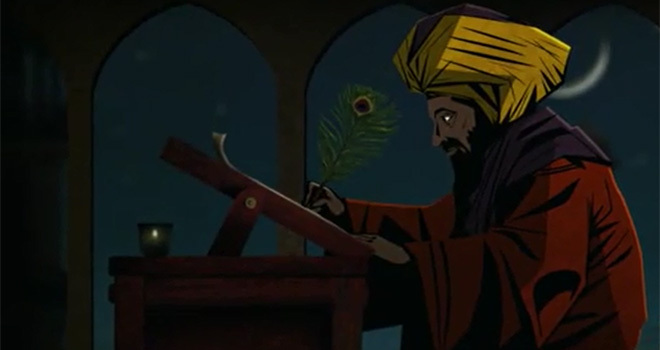 However, on seeing the scale of the task, Ibn al-Haytham quickly realized that it was beyond him. He was promptly imprisoned in Cairo for wasting the caliph’s time. The work can be roughly divided into Books I, II and III, devoted to the theory of vision and the associated physiology of the eye and the psychology of perception; and Books IV to VII, covering traditional physical optics. The work’s most celebrated contribution to science is its explanation of vision. At that time, scholars’ understanding of the phenomenon was a mess. The Greeks had several theories. In the fifth century bc, Empedocles had argued that a special light shone out of the eye until it hit an object, thereby making it visible. This became known as the emission theory of vision. It was ‘refined’ by Plato, who explained that you also need external light to see. Plato’s student Aristotle suggested that rather than the eye emitting light, objects would ‘perturb’ the air between them and the eye, triggering sight. Other philosophers around this time, including Epicurus, attempted a form of ‘intromission theory’ of vision (light entering the eye from outside), but it was Plato’s theory that was given a mathematical basis by Euclid, who described light rays emerging in a cone from the eye. Several centuries later, Ptolemy expanded on this idea. It took the genius of Ibn al-Haytham to finally resolve the issue. He argued that if we see because rays of light are emitted from the eye onto an object (Plato and Euclid’s ‘sight rays’), then either the object sends back a signal to the eye or it does not. If it does not, how can the eye perceive what its rays have fallen on? Light must be coming back to the eye, and this is how we see. But if so, what use is there for the original rays emitted by the eye? The light could come directly from the object if it is luminous or, if it is not, could be reflected from the object after being emitted by another source. Rays from the eye, decided Ibn al-Haytham, are an unnecessary complication. Later Islamic scholars, including the thirteenth-century Persians Qutb al-Din al-Shirazi and Kamal al-Din al-Farisi, extended the Optics. Al-Farisi, who wrote The Revision of the Optics (Tanqih al-Manazir), used geometry to arrive at the first correct mathematical explanation of the rainbow (at the same time as, but independently of, the German scholar Theodoric of Freiberg). Ibn al-Haytham’s work decisively influenced the theory of perspective that flowered in Renaissance European science and art. De Aspectibus was translated into Italian in the fourteenth century, making it accessible to practitioners such as the Florentine art theorist and architect Leon Battista Alberti, author of the 1435 treatise On Painting (Della pittura), the sculptor Lorenzo Ghiberti and the geometer-artist Piero della Francesca. They harnessed Ibn al-Haytham’s discussions on perspective to help to create the illusion of three-dimensional depth on canvas and in friezes. These revolutionary artists strove to understand both the objective world and the visual system that determined its appearance. Today, as we use laser beams to manipulate atoms, stimulate neurons with light or convey information in entangled photons, it is worth recalling that the foundations of this field were laid down around 1,000 years ago by Ibn al-Haytham. By Jim Al-Khalili, published in Nature, February 11th 2015. ← Copernicus and Ibn al-Shatir: does the copernican revolution have islamic roots?